At hospitals across the country, physicians, pharmacists and nurses are constantly coping with a persistent, potentially dangerous problem: medication shortages. From the most potent antibiotics and painkillers to anesthetics, tetanus vaccines and life-saving drugs for people with hemophilia and immune disorders, dozens of medicines have been tough to find or completely unavailable over the last few years. About 80 percent of the shortages involve injected drugs difficult to manufacture because they must be sterile. But experts cite other reasons. Fewer drug companies are willing to make indispensable but low-profit vaccines and other medicines. Sole manufacturers of some drugs decide to end production. Demand suddenly spikes. Shortages of ingredients occur or other manufacturing disruptions develop. There's also the problem of aging plants that no longer meet sterility standards and that are temporarily shut down, either voluntarily or by regulators. While several standard childhood vaccines have been hard to obtain the last few years, the problem is most critical at hospitals and nursing homes, where patients usually are very sick, said Dr. Mark Goldberger, the Food and Drug Administration's drug shortage coordinator. "This will continue to be a problem for a while," he predicted, partly because drugmakers trying to wring the most profit from each production plant sometimes scrap drugs that bring little profit because of generic competition. "In the longer term, I would hope we'll see some improvement," Goldberger said. 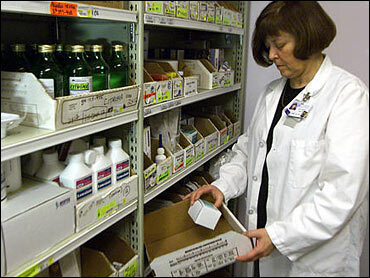 Hospital pharmacists say shortages have rarely harmed patients. Yet their professional organization, the American Society of Health-System Pharmacists, notes that three San Francisco-area patients died of bacterial meningitis last year after their doctor, unable to get an injectable steroid drug they needed, had it compounded at a local pharmacy; the solution was contaminated. Last month, pharmaceutical company Wyeth said that because of low profits, it stopped making vaccines for influenza and pneumonia. The move leaves only one U.S. drug-maker making either one. Among other recent problems, the only U.S. maker of anthrax vaccine couldn't meet federal standards for nearly four years. And after last fall's anthrax scare, people hoarding Cipro had doctors worried there might not be enough for other infections the antibiotic treats. Hospitals have also weathered shortages of some anesthetics, the antibiotic vancomycin, the powerful painkiller fentanyl and a drug for reversing morphine overdoses, Narcan; rationed tetanus shots to the most vulnerable patients for months; and scrambled through shortages across whole classes of medications that treat many serious diseases, such as injectable steroids and diuretics. "During the '80s and early '90s, if we saw one or two drugs that were on backorder ... that was a lot," said George Hartpence, who directs pharmacy services at the New Jersey Hospital Association. "At any given time, it seems there are about four dozen drug items that are near impossible to get." At the Saint Barnabas Health Care System, which runs nine hospitals and nine nursing homes in New Jersey, corporate pharmacy director Pam Allen says she's completely run out of several drugs, including Phenergan, an injected nausea medicine for pregnant and surgical patients. "We are constantly looking at what inventory we have in each location and we move it around" whenever possible, she said. "The irony is, sometimes we have to go back to the drugs that we were using before these (better ones) were available." Pharmacy directors often spend hours each week calling medication distributors to find key drugs, or calling manufacturers directly for ones they now ration to patients needing them most. More time must be devoted to keeping doctors and pharmacists up to date on drug shortages and alternatives, then to training nurses on administration of unfamiliar replacement drugs and their side effects. Nurses, in turn, must explain drug switches to patients and families. For some drugs, alternatives are not as effective, cause more side effects, are also in short supply or unavailable - or simply don't exist. Scott Mark, director of pharmacy at Children's National Medical Center in Washington, D.C., is particularly worried about the loss of an enzyme drug called Wydase when the only manufacturer stopped production. It's commonly used in hospitals to limit tissue damage when drugs in intravenous lines accidentally leak into surrounding tissue, a problem he estimates occurs twice a week in most hospitals. "Depending on how quickly it's caught, patients could lose a limb," Mark said. "Now everybody's using very rudimentary treatment, like cold compresses." He said some hospitals are particularly vulnerable to shortages because they have reduced drug inventories to cut costs. Those that can afford it, including the Saint Barnabas chain, have increased inventories slightly, although manufacturers usually ration drugs in short supply to prevent hoarding - by hospitals or by distributors hoping to jack up prices. The American Society of Health-System Pharmacists has been trying to help by posting current drug shortages and possible alternative medicines on its Web site, under a joint project with the University of Utah Hospitals and Clinics. It currently lists nearly 50 drugs as being in seriously short supply, unavailable or discontinued, plus another 11 shortages resolved earlier this year. "They keep coming so fast and furiously," said Linda S. Tyler, the university's pharmacy manager for drug information services. It started tracking local shortages in 1996, expanding to national ones in January 2001 when the problem worsened. Tyler tracked 119 last year -- not an easy task because manufacturers sometimes refuse to give reasons for shortages or estimate their duration. The FDA's Goldberger said the agency is trying to find alternate sources, letting troubled plants keep operating under closer supervision and even allowing importation of drugs from other countries. However, it can't make manufacturers produce drugs they don't want to make. Companies that stop making a drug only have to notify FDA if they are the sole source and it's for a life-threatening condition. Some say the FDA, by getting tougher on manufacturing plants that don't meet standards, is partly to blame for the shortages. But Goldberger says the level of scrutiny hasn't changed. "Some facilities where injectable drugs are made are up to 30 years old (and) haven't been updated," he said. Still, problems can arise even with the newest drugs and plants. The complexity of producing medicines that are genetically engineered or made from human tissue, such as arthritis drug Enbrel, means growing demand can fast outstrip production capacity - even when there aren't any manufacturing problems.